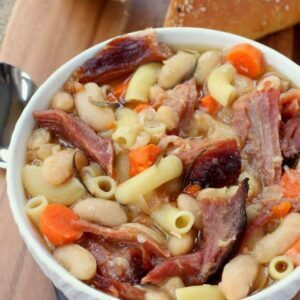 This slow cooker soup recipe is the perfect way to use your leftover ham bone from a holiday dinner! Trim any excess ham from the ham bone, you’ll need approximately 1 pound of ham for this recipe. Place all the ingredients except the pasta in a slow cooker and cook on low for 8 hours. If possible, stir the soup halfway through cooking to make sure the beans are down in the broth. Remove the ham bone, bay leaves, carrots, celery, onions and rosemary stems from the slow cooker, reserving the carrots. Dice the carrots into smaller pieces and return them to the slow cooker. Add the extra ham back into the slow cooker along with the cooked pasta. Taste the soup for seasonings and add any additional salt or pepper if needed. If the flavor of the broth is too strong, you can add a little more water until it is to your liking. If you don’t have dried beans, you can substitute canned beans. Just add them in during the last hour of cooking.